The American artiste St. Vincent, who is fresh off a performance at the Grammy Award ceremony, has unveiled a video for her recent song. Indeed, the singer’s clip for ‘Masseduction’ is out. Featuring St. Vincent singing in front of mushroom-shaped clouds, the video for ‘Masseduction’ is now available. In fact, the singer is performing while a nuclear bomb explodes in the background. The track comes from her acclaimed album of the same name which was released in 2017. The news about ‘Masseduction’ comes a few days after St. Vincent’s performance at the Grammy Award ceremony. 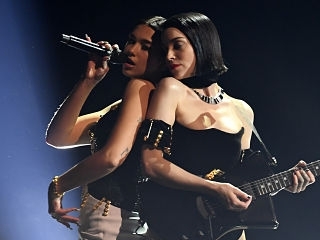 Indeed, she performed her prize-winning song alongside Dua Lipa who joined her on stage. On the same night, the artist was awarded her own statuettes for Best Rock Song and Best Recording Package. Furthermore, ‘Masseduction’ is the fifth studio album by St. Vincent and managed to reach number 10 on the Billboard 200. Alongside the title track, it also features ‘Happy Birthday, Johnny’, ‘Young Lover’ and ‘Los Ageless’, among others. Her most popular tracks throughout her career include ‘Digital Witness’ and ‘Cheerleader’. Starting to play the guitar at the age of 12, St. Vincent’s musical style delves into soft and experimental rock, electropop, and jazz. She has stated that musicians such as Jimi Hendrix, David Bowie and Kate Bush have inspired her.